Is Simply Blue Heaven ! The Blue Hole is just one attraction in Big Pine Key can easily be missed if you aren't careful. When you go driving down the Key Deer Boulevard you may see quite a few cars parked on the side and wonder what is going on in the bushes! Well you shouldn’t worry, as there is nothing untoward going on. And don’t worry about what actually makes this place “Blue” either, it’s simply a wonderful little piece of the real Florida Keys that you should stop at. This is actually an abandoned rock quarry, that is connected to the Key Deer Refuge in Big Pine Key. When Henry Flagler did the amazing job of building the overseas railroad through the length of the Florida Keys, he needed somewhere that he could use to get the rock and stuff for nearby road fills. And digging away he of course had to end up with a hole in the ground, which is what this place is. That doesn't really make it sound appealing does it, but keep reading as it will get better. You see the beauty of the place is that the rock quarry has over the years become an absolute magnet for the local Florida Keys wildlife, due the freshwater that has filled it up. Having no connection to any rivers or streams, as all the water comes through rainfall, it is unusually pure which makes it the perfect place to nourish and provide refreshment for the wildlife that can be found throughout the Florida Keys. So What Animals Can I See At The Blue Hole? With a sharp eye, and of course a bit of luck you will see lots of animals. However we must start with the most famous and the biggest pull for the tourist and local nature lovers who flock to this area in Big Pine Key year after year. 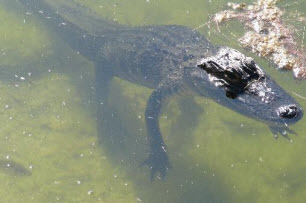 Laying within its watery depths, the hole is the home of choice for the only two resident gators found live in the Florida Keys. If you are lucky enough you may see them lazing on the side of the banks in the sunshine waiting for the next meal to come along. The female seems to be a lot tamer than the male, and quite often will be hanging around the viewing deck, which makes her perfect for the odd snap or two. The male is a bit more distant and you will be doing really well to see both of them at the same time. But I suppose that challenge is even more a reason to drop by the Blue Hole whenever you are in the area. One word of advice, if you fancy bringing a few snacks that you fancy throwing into the water to lure the alligators towards you, then you better not. Not only is it dangerous to feed the gators, but it is also illegal. And you are watched as rangers and volunteers patrol the area to make sure it remains the haven that it is. But that's enough about the alligators, let's now give you the rundown of the other animals that are drawn to the area which you will quite often spot. Recently, the locals spent the day spotting and registering all the different types of birds that they could see, and marked down 27 species. Bald eagles, six types of hawks, Peregrine Falcons, Frigatebirds, American Kestrels as well as more common birds such as woodpeckers, and Turkey vultures are all in residence. So make sure you bring your binoculars as if you are into ornithology then the Blue Hole will be right up your street. Away from the skies, iguanas, snakes, lizards, frogs and of course the famous and gorgeous Key Deer are all to be seen around the area. Amazingly on top of all this, in 2005 when Hurricane Wilma blew into town many fish such as tarpon, barracuda and mojarra ended up in the freshwater quarry, not being carried by the strong winds, but due to the storm surge that accompanied the hurricane. Being normally found in the waters around the Florida Keys you would think that saltwater fish would simply die, but instead they have actually flourished, with many biologists surprised by this feat. Going back to the Key Deer, if you are taken with the thought of seeing more of these lovely little animals then remember the actual Key Deer Refuge is just up the road. So for more information on this, which is a good way of filling up your day, as for most people the Blue Hole wont take more than a couple of hours, then click here. How Do I Get To The Blue Hole? To get to the nature reserve you must drive down the US1 Overseas Highway until you get to Mile Marker 30.5 Bayside. And then its as easy as turning into Key Deer Boulevard and looking for the sign. If you are unsure where Big Pine Key is then check out our detailed map on the Florida Keys which will point you in the right direction. But as a rough guide, if you are driving down the Florida Keys to hit the activity of the Southernmost point, which most people do on their vacation, then the Blue Hole is about 30 miles away from the island of Key West and 68 miles from the start of the Keys in Key Largo. 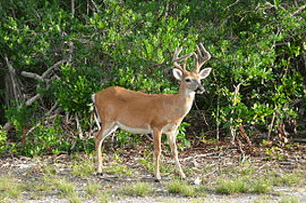 Address: Key Deer Boulevard, MM 30.5 bayside, Big Pine Key. Once you have finished with the Blue Hole you can easily kill half an hour to an hour by following the Jack Watson Nature Trail. 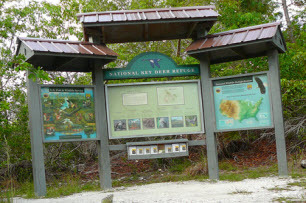 The loop has a been created to teach visitors about the flowers and plants that can be found in the Florida Keys. The hole is 1/4 mile north of the intersection of Key Deer and Watson Boulevards.